As ship building momentum continues on the Mekong River in Southeast Asia, Pandaw River Cruises too has announced plans to build an additional ship on the river, the Saigon Pandaw, slated for completion in November 2011. “Recent growth on the Mekong has been far higher than anticipated with greater numbers of Americans and Australians traveling to Southeast Asia,” Yim Choong Hing, CEO of Pandaw River Cruises, said in a statement. When completed, the ship will be Pandaw’s fourth Mekong river ship, joining the Mekong Pandaw, Tonle Pandaw and Indochina Pandaw. All four ships will be offering cruises through Vietnam and Cambodia. In the last year and a half, Pandaw River Cruises, a Singapore-based river cruise line with head offices in Scotland, opened a U.S. reservations and sales office in Breckenridge, Colo. to enhance sales stateside. The Saigon Pandaw will be similar to the Indochina Pandaw, which was built in 2008. The vessel with have 30 cabins averaging nearly 200 square feet in size. The cabins will be outfitted with French doors that will open onto a common deck with seating from which passengers can view the passing landscape. Since 1995, Pandaw has been operating on the Irrawaddy and Chindwin rivers in Burma, on the Mekong in Cambodia and Vietnam, and on the Rajang River in Borneo. The company’s Pandaw II vessel sails in Burma, and the Orient Pandaw in Borneo. All Pandaw ships serve a combination of local and western cuisine, and wine with dinner as well as complimentary local spirits. The ships are built with shallow drafts to allow them to moor where larger ships cannot go. For late 2011, the Saigon Pandaw is sailing charter only, and will sail a regular season for 2012-13. 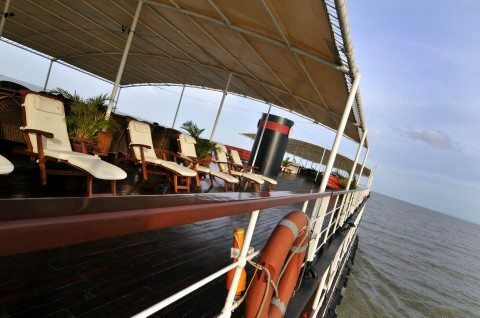 It will sail Pandaw’s Mekong Exploration seven-night cruise from Siem Reap in Cambodia to Ho Chi Minh City in Vietnam through Phnom Penh in Cambodia. Pandaw offers an optional two-night pre or post tour in Ho Chi Minh City, as well as an optional two-night extension to Angkor Wat. The news comes during a year when river cruise operators such as AmaWaterways and Viking River Cruises have developed their Mekong river cruise programs. Viking has partnered with Pandaw to charter the 66-passenger RV Tonle for 15-day itineraries on the Mekong River through Vietnam and Cambodia for the 2010-11 season. AMA began offering Mekong sailings in September 2009, when the 92-passenger La Marguerite was launched. Earlier this year, AMA said it plans to introduce a second 124-passenger ship on the Mekong that will launch in summer 2011. AMA will have partial ownership of both ships.